Over the last few decades, the archaeological museum has been changed from a collecting place to a narrative environment. According to the new museum making process, designing an exhibition inside a space means generating ‘narrative experiences’ which integrate objects, space, and audience and create an environment in which the visitor can understand and learn MacLeod, 2013). Adapting recent developments in museum and exhibition design to the contemporary digital age, museum professionals have increasingly employed multimedia in their exhibitions. The creative use of technology in historical and archaeological exhibitions allows museums to change the way of presenting objects and communicating their meaning, to show artifacts in their context, to reconstruct historical events, to increase opportunities for interactivity, or to provide involving experiences. Multimedia exhibits include audio-visuals, computers, photographs, videos, immersive theaters and the combination of two or more of these comprises a real multimedia experience, although the term ‘multimedia’ is also often used for only one communication system. In archaeological museums, using new technologies can prove to be useful to fulfill the intrinsic needs of archaeological objects for understanding their contextualization and reconstruction. Often history gives back missing understanding to items in their essential shape; however, this principle is unsatisfactory as widely demonstrated by many ‘museum games’ which have largely moved themselves away from the traditional concept of the museum, often renouncing completely even physical objects. These are, certainly, enjoyable and valuable but their nomenclature is different from that of ‘museum’. Therefore, it is important to understand how, in recent years, many European museums have begun a renewal (cautious or not) moving toward the realization of more contemporary and interactive exhibitions. (La Scala, 2013). 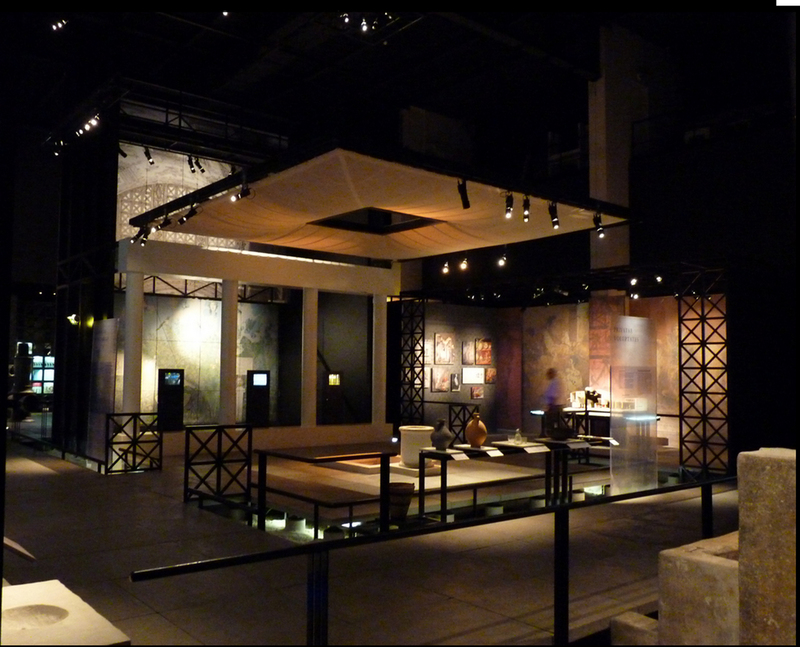 A good example of well-balanced design in multimedia tools within the exhibition is the recent exhibition inside the Site-Museum of Pont du Gard, an archeological site in the south of France including a Roman aqueduct 50 km long. The exhibition, following a thematic concept, accompanies the audience into Ancient Roman time. Models, virtual reconstructions, multimedia screens and other diverse interpretative tools are well-combined with real artifacts, focusing on different parts of the site’s history, accurately recreating the images of the ancient site. Pont du Gard is a Roman aqueduct, part of the Nîmes aqueduct. It was built to lead water from the Uzès colony to the Nemausus colony, that is Nîmes (Guilhelm, 1992). Inside the museum modeled as the Domitia (road), a thematic journey leads the audience into the Ancient Roman world. Models, virtual reconstructions, multimedia screens show the visitors the original vestiges of the archaeological site, a World Heritage Site since 1985. Each part of the exhibition explores a specific historical period of the site, evaluated as one of the most considerable sites of the Roman age. Throughout the museum, multimedia technologies accurately recreate the image of the past always placed close to the original finds. In the beginning of the visit a multi-screen installation concerning the history of Nimes told by films, audio and illustrations through ancient and contemporary everyday life scenes, leaves out the role of the water for the city. Finally, a large model of a Roman house reveals how even then the irrigation of gardens, tubs and faucets worked with running water under pressure. In addition, a huge illuminated map displays the location of the major aqueducts in the Roman Empire. Moreover, a life-size reconstruction of the quarry of the Pont du Gard, of its channel and arches, shows the combination of design, ingenuity and technical skill in construction. In a different manner an Italian museum displays Ancient Roman history. This unique museum in Italy, which makes technology the one and only communication medium with the subordinate function of being a place of knowledge, learning, and entertainment, is the MAV (Museo Archeologico Virtuale) in Herculaneum. The MAV, located close to the archaeological excavations of ancient Herculaneum, was opened in 2008. 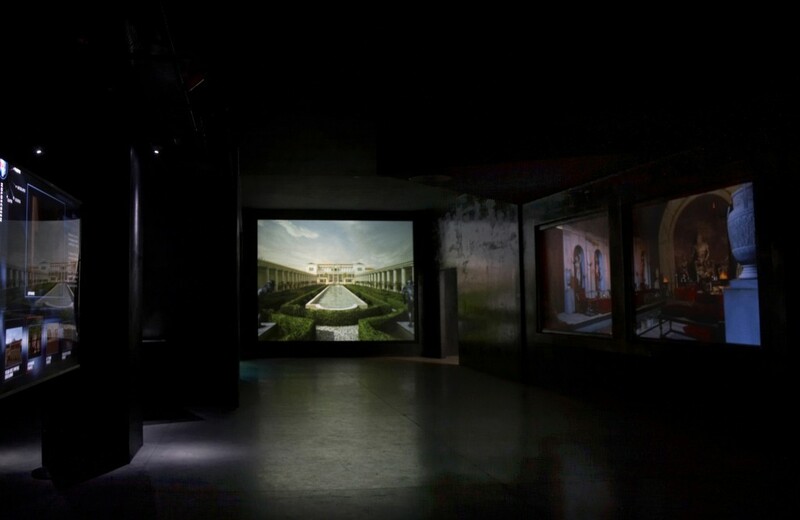 The entire exhibition aims to lead visitors on a journey back in time, to a minute before the eruption of 79 AD, which destroyed the Roman cities of Herculaneum and Pompeii (www.museomav.it) The choice of placing the exhibition in the basement of the museum comes from the idea of simulating a descent into a distant past. In order to rediscover the reconstruction of the great works, today reduced to ruins, the visitor should ideally retrace the steps of the early eighteenth century archaeologists who were lowered into the tunnels dug in the lava to unearth ancient Herculaneum. The exhibition makes use of multimedia and interactive technologies exclusively and the whole exhibition doesn’t include real objects; over seventy devices, including virtual and interactive installations, present the everyday life of the Herculaneum people and the ancient glories of the city. The exhibition, which often appears non-linear, is submerged entirely in darkness; the feeling of the absence of light is ensured by the dark color of the floor and ceiling. At the beginning of the journey, the visitor comes across some of the inhabitants of Herculaneum: on a long screen appear images of the faces of Roman statues, which portray the main characters of the city while audio recordings recount, through excerpts from classical texts, the daily life of the people of Herculaneum and the ancient glories of the city. After crossing the reconstruction of the Bourbon tunnels that, in the eighteenth century brought to light the ruins of the Ancient Roman city, the visit begins with a series of multimedia installations, interactive and virtual. On a wall, apparently a layer of ash, moves away at the touch of your hand and allows a fresco to appear, one of those that graced the walls of ancient Roman villas. By waving a hand, a mosaic copy, probably one of the mosaic apparatus inside the ancient bath, seems to be immersed on the floor. ‘Moving’ the steam with our hand we can see a fresco on another wall depicting women taking a bath, revealing the configuration of the ancient thermae. Passing through a fogscreen – a barrier of vaporized water – the visitor experiences the moment of the eruption of Vesuvius, evoking the moment when the fiery cloud buried the Roman cities. However surely the mostly used technology in the exhibition is the immersive virtual reconstruction: large virtual panoramas reproduce the ancient Roman villas, today only in ruin. (e.g. Pompeii Stabia, Herculaneum). Three-dimensional images are projected on screens placed on one long wall or on three continuous walls (perpendicular to each other) and the visitor stands in the middle of them. If graphically the reconstructions can be very fascinating, however, the wrong scale reproduction and the absence of adequate navigation tools make it almost impossible to navigate the three-dimensional spaces. In this case, the virtual reconstruction distances the audience from the context and its significance, leaving only the memory of an interesting technological experience. During the visit, the devices used often are not hidden and remain visible to the audience. If, on the one hand, this serves to maintain a kind of separation from the reproduction finds, aiming to underline that the museum does not claim to replace the ruins, but only to provide information supporting the understanding of them, on the other hand, however, it emphasizes the inadequacy of an exhibition planned by a team of expert technology professionals (i.e. the design of the exhibition was entirely created by a computer company producing the technological tools used within the museum itself, Capware Digital World, without involving professionals such as architects, archaeologists or museographers). Moreover, the absence of objects often determines a disconnection with the close archeological site to which it is directly linked. Due the complexity of the technologies, the use of different forms of innovative media can appear quite complicated, especially for non-specialists. To achieve effective communication, multimedia should help the visitor to create a real connection between all the exhibits in the recognition of a general narrative. Instead, developing high-tech exhibitions without carefully considering the interpretation level of the museum or without evaluating how the exhibitions themselves may involve the visitors and condition their experiences can falsifiy the story telling because of a series of expensive and ruinous gadgets (R. Janes 2013). Consequently new media should not be seen as a replacement of ‘traditional’ means of communication, but must provide a significant addition to the existing techniques whereas a wider range of availability can allow the designer to choose the most appropriate for the purposes of communication. In conclusion, it is essential to consider, from the beginning of the design process, how tools can be well inserted in the exhibition considering each collection that reflects a diversity of use of them. So the exhibition designer must conceive the exhibition as an overall environment in which all the elements, exhibits, electronic devices, visual communication tools and, above all, physical objects, are put together in a system. Guilhem, F. The Pont du Gard: water and the Roman town. Paris: Caisse nationale des monuments historiques et des sites. R. Janes, R. (2013), Museums and the paradox of change. London: Routledge. La Scala, P. (2013). “New technology for archaeological museums: three case studies on the Mediterranean coast”. In M.C. Ruggieri Tricoli, M.L. Germanà (curs.) Urban archaeology enhancement – Valorizzare l’archeologia urbana. Pisa: Edizioni ETS, 391-439. MacLeod, S. (2013). Museum Architecture: a new biography. London: Routledge. P. La Scala, Museums presenting past through digital technologies: MAV (Museo Archeologico Virtuale) of Ercolano and Site-Museum of Pont du Gard case studies. In Museums and the Web 2013, N. Proctor & R. Cherry (eds). Silver Spring, MD: Museums and the Web. Published May 31, 2014. Consulted .